We are located about 120 miles east of Denali Park at Milepost 42 on the Denali Highway. (on the Paxson side of the Maclaren River across from Maclaren Lodge. We cater to those folks who can be self-contained and wish to get away from the hectic pace to explore the wonders of the Denali country on their own. No cell phones, no television; just real nature and you. Our private log cabins have either wood or propane heat. Each cabin has cooking facilities. There is also a full-service Lodge just across the Maclaren River bridge. The Homestead Cabin also has a deck overlooking a small pond. The Homestead has a Queen bed and a bunk bed. Headed to Denali Park, St Elias or Valdez? Your Alaskan adventure begins here! The Denali Highway is the original route to the Park, Lightly traveled, but an excellent gravel , this highway has limited services. Our Denali cabins are comfortable and secluded, accommodations within a few miles of the Maclaren Glacier. If you are a traveler looking for a place to rest that is more than just another hotel room, then this is the place for you. Spectacular peaks of the Alaska Range are at your doorstep. 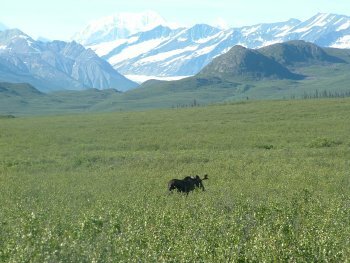 Moose, caribou, grizzlies and wolves call this area home. 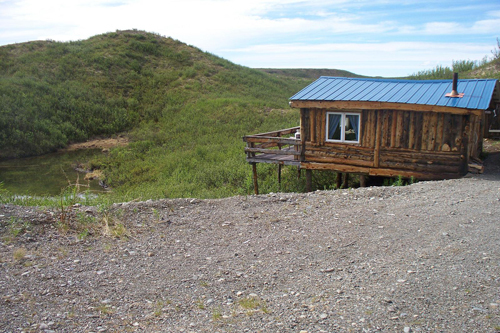 Beautiful cabins with glacier & mountain views on the Denali Highway! Cooking range in each cabin, dining tables, all furnishings, private reading decks on each cabin and easy access to river, atv & walking trails. The Shower House, powered by gravity flow and solar, is located near both the Loon and Homestead cabins. The River cabin is the oldest of our cabins. It was built in the 60's on the Maclaren Lodge side of the River. Destined for the burn pile, we pulled it across the bridge with an old ford truck. It has been rebuilt and refurbished and is right on the banks of the Maclaren. The River cabin has propane heat. There are 2 twin beds in this small cabin.